To make it easy, we answered some of the most common customer questions we encountered during the years. Download and unzip the WordPress package if you haven’t already. Create a database for WordPress on your web server, as well as a MySQL user who has all privileges for accessing and modifying it. Upload the WordPress files to the desired location on your web server:If you want to integrate WordPress into the root of your domain (e.g. http://example.com/), move or upload all contents of the unzipped WordPress directory (excluding the WordPress directory itself) into the root directory of your web server. How do I find a good host for my WordPress website? Often overlooked, web hosting is one of the key component of every successful website. Choosing the best web hosting for your needs can improve your SEO and increase sales. There are various different types of WordPress hosting options available such as Free, Shared, VPS, Dedicated, and managed WordPress hosting. One of the oldest web hosts started in 1996, Bluehost has become the largest brand name when it comes to WordPress hosting. They are an official “WordPress” recommended hosting provider. You never have to worry about your website being slow even when there is alot of traffic. They also offer a Free Domain and a Free Site Builder with templates. InMotion hosting has been a well-known industry brand with reliable performance for business class hosting. With award winning technical support and 99.9% uptime, they are a user favorite. Their unmatched U.S. based support is always there to help. InMotion Hosting’s WordPress Hosting is optimized for active bloggers, and offers great scalability for your blog’s growth. Web Hosting Hub is the easiest way to get online presence for small businesses. Easy control panel, website builder, and WordPress combined with their amazing support, it is hard to beat their price and value. Site5 is one of the most popular web hosts in the WordPress community. They have excellent support, but most importantly they have excellent service. They are one of the WordPress hosting companies that can offer location specific web hosting. Aside from various locations in U.S./Canada, they have servers in Netherlands, Romania, London, Sydney, Brazil, India, and Singapore. They offer shared hosting as well as VPS and Cloud hosting. WordPress users may install and switch between themes. Themes allow users to change the look and functionality of a WordPress website or installation without altering the information content or structure of the site. Themes may be installed using the WordPress “Appearance” administration tool or theme folders may be uploaded via FTP. The PHP, HTML & CSS code found in themes can be added or edited for providing advanced features. Thousands of WordPress themes exist, some free, and some premium (paid for) templates. A WordPress child theme is a theme that inherits the functionality of another theme, called the parent theme. Child theme allows you to modify, or add to the functionality of that parent theme. A child theme is the safest and easiest way to modify an existing theme, whether you want to make a few tiny changes or extensive changes. Instead of modifying the theme files directly, you can create a child theme and override within. If you modify an existing theme and it is updated, your changes will be lost. With a child theme, you can update the parent theme (which might be important for security or functionality) and still keep your changes. It can speed up development time. It’s a great way to get started if you are just learning WordPress theme development. I don’t know what all the WordPress terms mean. Where can I get help? The WordPress Codex has a Glossary where you can find definitions of many of the key phrases associated with WordPress. WordPress is a Content Management System (CMS). It’s a simple, yet immensely powerful application that helps you create, manage, and share your content easily on the web. Currently WordPress has two versions, WordPress.com (hosted) and WordPress.org (self-hosted). Whether you want to set up a one page blog or a full blown commercial website, WordPress can handle your needs. For more information visit WordPress official website. WordPress is the open source software that powers millions of websites around the web, including this one. WordPress.org is the center of the WordPress community. This is the website where the core software is hosted, along with thousands of free themes and plugins, all of which are 100% free to use and modify. Isn’t open source software beautiful? WordPress.com – A hosted version of WordPress. WordPress.com is a commercial website where you can host a free site with some limitations or pay for upgrades. However, WordPress.com relieves you of having to set up and maintain WordPress on your own server. Please note that our themes are available only for WordPress.org. What browsers and operating systems are supported? We test all our themes on Internet Explorer 10+, the latest versions of Firefox, Safari. and Chrome. Regarding operating systems, our themes are independent of the operating system you use and will work as long as WordPress is installed correctly. We do not support Internet Explorer 6, and 7. If you are using IE7 or older, please consider upgrading to the latest version to have the best experience with our themes. Can I use HB themes on a WordPress.com account? Unfortunately, HB themes can only be hosted on self-hosted sites, and are not available for use on a WordPress.com free hosted account. Yes, logo is a PNG file that is used only as an example on our demo sites. You can easily upload your own image logo in the theme options panel, or set a text title instead of using an image. Logo is your personal stamp and we would never deprive you of the possibility to change it. If I’m not satisfied with my purchase, can I get a refund? Please take a look at our Refund Policy. How long does support last? Support on all HB themes is for the lifetime of the theme. You can always send us an email with your questions and we’ll help you out. Can I test drive a theme before purchasing? Unfortunately, we do not offer a trial for our themes. If you find the product does not work the way you need we can easily refund your purchase. Do your themes work with plugins? Yes, almost all of the plugins should work with our themes, but we can’t guarantee they all will. If our theme has a plugin integrated in it, it might cause a conflict if you try to install it separately. There are some plugins that conflict with code used in the themes, which will make our themes not function properly. If a plugin is not functioning correctly you can always send us a line. Yes. Our themes have licenses. The license allows you to update your theme and receive support. Each license is valid for one usage and it has lifetime support and updates. On how many websites can I use your theme? There are several licenses available for our themes. Regular License – Allows you to use the theme on 1 domain. 5-Domain License – Allows you to use the theme on up to 5 domain. Developer License – Allows you to use the theme on unlimited domain. How do I get support for my purchase? There are various ways of getting support for your purchase. If you are just starting to use WordPress and premium themes then it might be convenient to search through our support website for your questions. If you are unable to find answers on our website, then you can post questions on the marketplace, under the according theme. We are always checking our emails and we really make an effort to answer you as soon as possible. So if you need detailed instructions without going public, feel free to drop us a line. How do I get a copy of the demo data? Each theme package contains a folder which has a WordPress Export file. When you unzip your ThemeName_version.zip file locate the Demo folder and in that folder find an XML file. If you are unable to locate the file or it is broken in some way feel free to contact us and we will get you a freshly baked copy, just coming from our servers. Can I replace footer copyright text? Everything is fully customizable with our themes. All texts and images can be changed via the WordPress Dashboard. In our themes, the footer copyright text can be changed in the Theme Options of that theme. Our demo sites have an example copyright text written which you may or may not use for your own website. Can I easily translate my theme? If a theme is advertised as localization and internationalization ready, then you can easily translate the theme. Each will contain a .po and .mo files which you can use to translate the theme. Using a translation tool, such as Poedit you can generate new files with your translations. After you generated your new .po and .mo files it’s time to tell WordPress that it should use them. If you do not want to use the .po and .mo files then you can use some plugins which are really good, such as QTranslate or WPML. Can I use my theme for a client’s site? Yes. You are purchasing a license for a website, which doesn’t have to be yours personally. And on the bonus side, more people will get in touch with our themes. Do you offer customization/design services? Yes. If you are interested in modifying our themes or you need someone to help you out in building up your website, you can fill up a form on our Hire Us page. We’ll get back to you as soon as possible. Note: Sometimes, our hands are full and we might be unavailable for custom work at that time. But if you are not in a hurry, then feel free to contact us again a few weeks later. Do your themes work with child themes? Yes. All of our themes are child theme compatible. You can add any style and functionality you want. It’s really simple! How do I create a child theme? And that’s it! Your theme should appear in your Appearance > Themes if you’ve made that folder in the wp-content/themes/. For more information on working with Child Themes, please read up at http://wordpress.org. How to request a free theme installation? As the theme authors, we provide a Free Theme, Plugin and Demo Template installation. How can I embed videos in WordPress posts? All you need to do to embed something into a post or page is to post the URL to it into your content area. Make sure that the URL is on its own line and not hyperlinked (clickable when viewing the post). WordPress will automatically turn that into a YouTube embed when the post is viewed. As of 3.5, Auto-embeds are automatically enabled and there is no setting to turn them off in the WordPress admin pages. Prior to 3.5, there was an “Auto-embeds” checkbox in Administration > Settings > Media SubPanel. If WordPress fails to embed your URL you will get a hyperlink to the URL. How do I use smileys in my posts? Smileys, also known as “emoticons,” are glyphs used to convey emotions in your writing. They are a great way to brighten up posts. To learn more about emoticons and their history, see the Wikipedia entry on Emoticons. How can I change permalink structure? 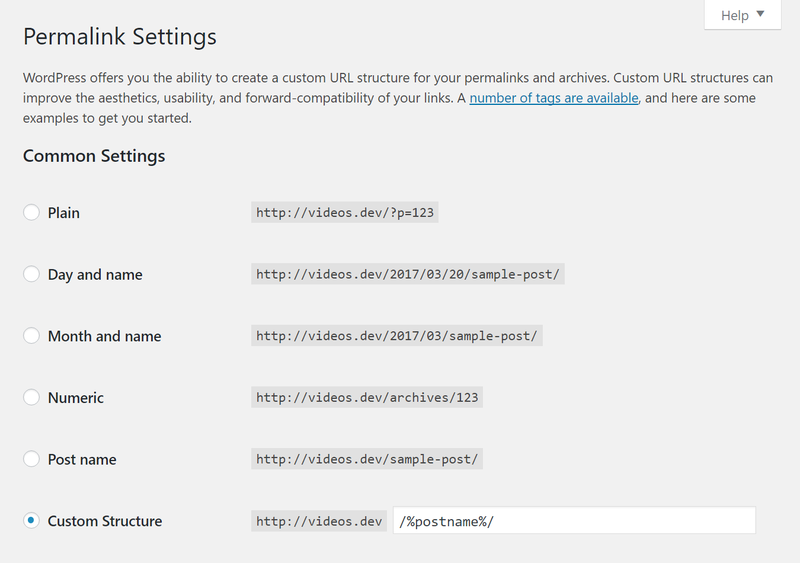 In the Settings → Permalinks panel (Options → Permalinks before WordPress 2.5), you can choose one of the “common” structures or enter your own in the “Custom structure” field using the structure tags. Please note: You never, ever put your site url in the permalinks slot. You must use one of the structure tags, or a combination of tags only. To activate PATHINFO permalinks, start your permalink structure with index.php/. How can I change how the date and time are displayed? You set the Default Time Format for your site via the Administration > Settings > General under the Date and Time section. How do I prevent comment flooding? Comment flooding is when a lot of comments (probably spam) are posted to your website in a very short duration of time. This is only one aspect of the broader problem of comment spam in general, but it can quickly overwhelm a moderator’s ability to manually delete the offending comments. WordPress manages the worst floods automatically by default. Any commenters from the same IP or e-mail address (other than registered users with manage_options capabilities) that post within 15 seconds of their last comment gets their comment discarded. The time setting can be changed by a number of plugins that extend this functionality. You might also consider one of the many broader spam blocking plugins, such as Akismet, or even turning your comment system over to Disqus. How do I Import a WordPress WXR file when it says it is too large to import? If a WordPress WXR file, an XML file exported from WordPress, is too large to import, there are several things you might try to overcome that limit. Increase the amount of memory a PHP script may consume. Note: If using a shared hosting service, you may need to ask your host to increase the limit. Increase the memory limit setting in php.ini (e.g. memory_limit = 64M ;). Many hosts may not allow this. Increase the memory limit via .htaccess (e.g. php_value memory_limit 64M). Many hosts may not allow this. Increase the maximum amount of a time a PHP script will run. Note: If using a shared hosting service, you may need to ask your host to increase the limit. Increase the maximum execution time in php.ini (e.g. max_execution_time = 600 ;). Many hosts may not allow this. Increase the PHP upload files size settings. Note: If using a shared hosting service, you may need to ask your host to increase the limit. Increase the setting values in php.ini (e.g. upload_max_filesize = 64M ; and post_max_size = 64M ;). Many hosts may not allow this. Increase the setting values via .htaccess (e.g. php_value upload_max_filesize 64M and php_value post_max_size = 64M). Many hosts may not allow this. Increase the setting values via ini_set lines in wp-config.php. Talk to your host for the correct values. Login to wp-admin as an administrator. GZip the file. On some hosting services, a gzipped file can be automatically expanded in the background, without WordPress ever knowing the difference. This can allow you to make the file small enough to be fit into the maximum upload size constraints. On Windows, use 7Zip to create a gz archive out of the wxr file. On Linux, use the gzip command line. Make sure that the resulting file has the file extension of “.gz” before uploading it, as this is often necessary. This is not guaranteed to work, as it highly depends on the hosting configuration. If this fails, then try another method instead. How do I change file and folder permissions? Open your File Manager and navigate to the file or folder that you need to change. Click on the name of the file or folder (WordPress Folder). Click on the Change Permissions link in the top menu of the File Manager page. Click on as many check boxes as you require to create the right permission. The permission numbers underneath the check boxes will update automatically. Click on the Change Permissions button when you are ready. The new permission level is saved and the display updated to show the modified file. My site loads slow. How can I speed it up? There are several things you can do to speed up your website. First thing you need to do is consider adding a caching plugin to WordPress. We use and recommend W3 Total Cache. Another thing you can do is use a Content Delivery Network provider. You should also consider using a better web hosting provider. Shared hosts are usually slower. If you are receiving a lot of traffic, then you should consider moving to a VPS or a Dedicated server. Where can I learn more about WordPress? WordPress is open-source, free software and there is online documentation and information available at http://wordpress.org. How do I choose different home page? By default, WordPress shows your most recent posts in reverse chronological order on the front page of your site. Many WordPress users want a static front page or splash page as the front page instead. This “static front page” look is common for users desiring static or welcoming information on the front page of the site. Create a Front Page: In Pages choose Add New Page. If the WordPress Theme offers an option to change the look and feel of the front page, select the Template in the Page Attributes panel box. Create a Blog Page: If choosing to add a blog, choose Add New Page again. Title it “Blog,” “News,” “Articles,” or an appropriate name. Do not use a custom Page template for this page. The template files home.php or index.php will be used to generate this page in the Theme. DO NOT add content. Leave it blank. Any content here will be ignored — only the Title is used. Go to Administration > Settings > Reading panel. In the drop down menu for Posts page select “Blog” or the name you created, or leave it blank if you will not feature posts on the site. NOTE: If Permalinks are not enabled, go to Settings > Permalinks and enable them as a page address of /index.php?p=423 defeats the purpose of making a static front page. Dedicated to create the most beautiful, professional & quality products. Best known for the detail-oriented design that suits everyone. Subscribe for theme updates, news, giveaways & more!